The coconut craze is flying by us with much talk of it’s healthy benefits. The coconut has become a go to replacement for water in many people’s diets. The oil from coconuts is being used instead of vegetable oils in cooking, especially within the Paleo Diet (that is a whole different topic of conversation). Here is the science behind these two trends in food market. Coconut water is not all that it is made out to be in the media. Some think that it is a good drink for post workouts because it contains electrolytes. But truth be told, it is not much better than water at rehydrating after exercise. And a bonus to water: Zero calories, as opposed to 46 calories per cup of coconut water 1. Sports drinks are meant to replace fluids, supply energy, and replace sodium and potassium lost through perspiration. Since unflavored coconut water is low in sugar and calories, it is not the best drink for during exercise either. Coconut water is however, a better choice than most fruit juices due to its lower caloric content and very high potassium levels. Caution once there is sugar added though, because that is when the calories start to rise, so choose the unsweetened varieties. Coconut oil is another part of the coconut that is being hailed as revolutionary, so let us dive deeper into those claims. Coconut oil is said to be beneficial to weight loss and curing Alzheimer’s disease. However, these claims have never been scientifically proven so they cannot be taken seriously. It is being widely used in new fad diets to replace other cooking oils due to it’s high concentration of “healthy fats.” Although coconut contain “healthy fat,” it still must be used sparingly because it does have high levels of saturated fat (more than butter!) with no protein, carbohydrates, or trace vitamins or minerals to add to it’s nutrient content. However, it does contain some antioxidant properties due to its plant nutrients. Coconut oil also boast high levels of lauric acid, which can raise both ‘good’ and ‘bad’ cholesterol so using moderate amounts of coconut oil has been tested and proven to have an effect on cholesterol levels 2. 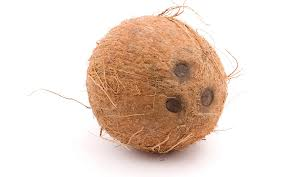 Now that you have been educated on the facts of coconut, you can go nuts for coconut! Not really, but you can use your new knowledge to properly add it to your diet so you can reap it’s benefits without over doing it.